a) Using right click allows you to draw additional information on your picture. b) Left-click alone allows you to create your own shape around your picture. c) Holding both ctrl and left click at the same time will create a rectangle. 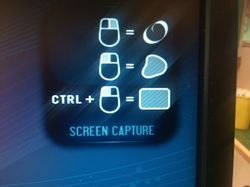 d) Pressing print scree button twice will take a picture of the entire screen.